Want to have on your table natural fresh and fragrant vegetables, the amount of pesticides and herbicides that would not exceed the norm, and even all year round? 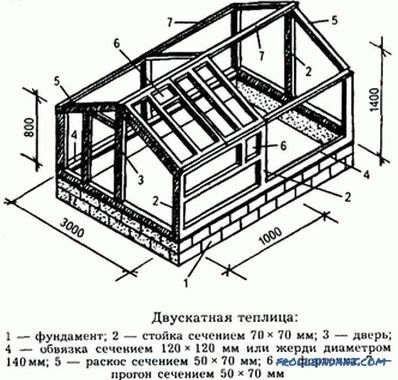 Then you just need to build a greenhouse on the dacha. Do not have a large amount to buy it? Not scary. 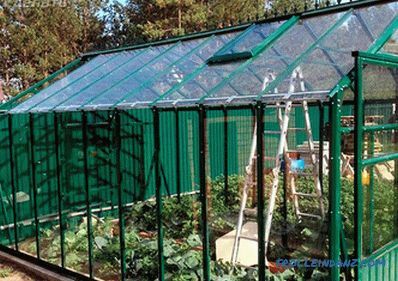 In this article we will look at how to make a greenhouse out of glass with your own hands, give drawings, photos and video instructions. 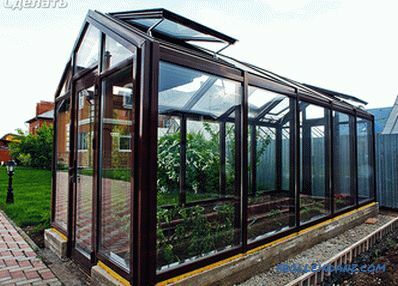 Glass greenhouses have been recommended by time as long-term constructions. 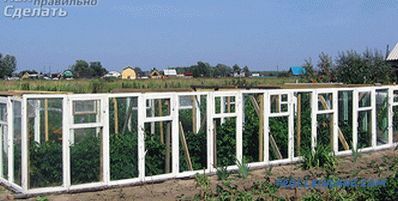 For example, the French actively use such greenhouses since the end of the XVI century, and to this day. 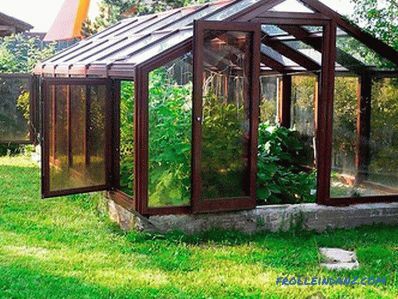 Be sure: the greenhouse from glass will be your servant for several decades. Glass does not trap ultraviolet rays, which are necessary for the rapid growth of plants and the ripening of fruits, which, therefore, allows the maximum benefit from the energy of sunlight. If multilayer or tempered (thermal) glass is used, then this construction can withstand the most adverse conditions (precipitation in the form of large hail, strong heat and even strong frosts will not be susceptible to construction). 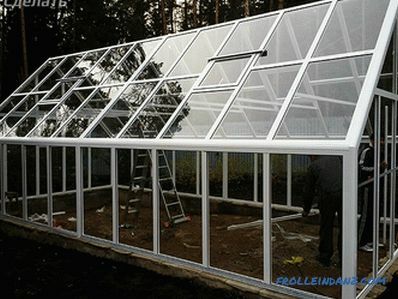 The glasshouse is characterized by excellent thermal insulation. In addition, there is the possibility of installing heaters in them. 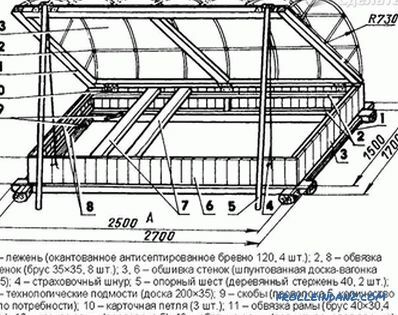 Of course, a greenhouse made of glass also has negative sides that must be considered when constructing it. For example, the fact that glass is a rather heavy material (1 m² of glass with a thickness of 4 mm weighs 10 kg, and 6 mm - 15 kg) should affect the presence of a solid foundation, as well as the construction of a sturdy construction - a frame. 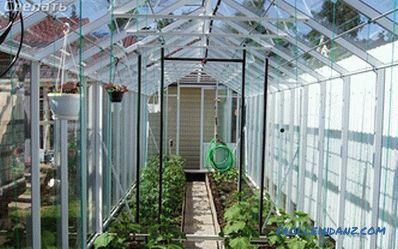 But unlike greenhouses covered with other materials, experienced amateur gardeners close their eyes to the shortcomings of glass-covered greenhouses, because, in their opinion, not only do green plants grow glass and bear fruit, but also get sick less. The degree of illumination of the intended location. 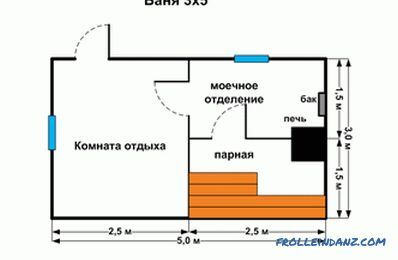 Since the greenhouse must be well lit, it is necessary to make sure that there is no overlap of the shadows of trees and other objects on the intended building plot. It is advisable to orient the greenhouse towards the south in order to ensure uniform distribution of sunlight and heat throughout the day. Wind mode. It is necessary to find a wind-blown place, in the absence of which the building must be installed so that the wall attacked by the wind can be reliably protected or planted with a barrage of a shrub or insulated with special materials. The surface layer of the soil and the relief of the selected area. It is necessary to find only a dry, as flat as possible place on a small knoll, otherwise there will be a decrease in air temperature and, as a result, a violation of the microclimate inside the building. 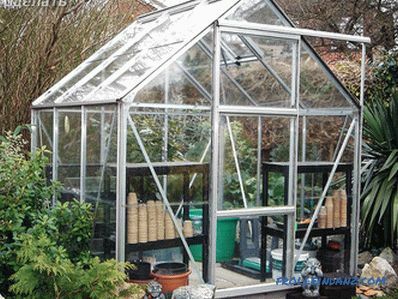 It should also be noted that if you want to use the greenhouse for a year, then you need to place it in the place where you can remove the top layer from the soil. 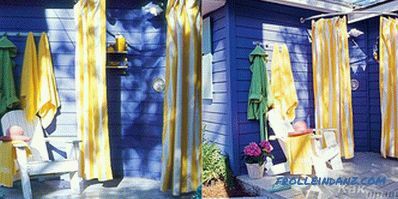 So, you protect your plants from winter winds and drafts. Remoteness from sources of water supply and power supplies. 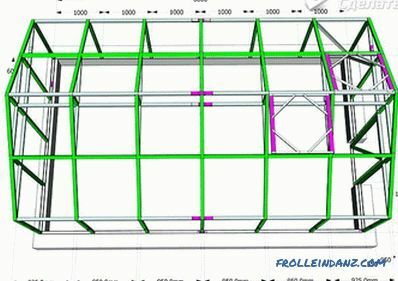 To to facilitate the construction process, it is necessary to choose a project, that is, a plan for the construction of a glass greenhouse developed before us, and to correct the drawings. What should be foreseen at this stage? Much will depend on the architectural shape of the greenhouse. Since you will cover it with glass, and this material does not bend, the choice is narrowed. 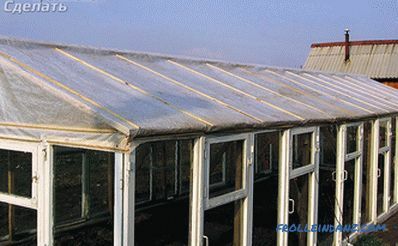 It is better to stay on a rectangular or multifaceted greenhouse under a single or gable roof. However, if you wish, the roof can be given a pyramid shape with four or more edges. 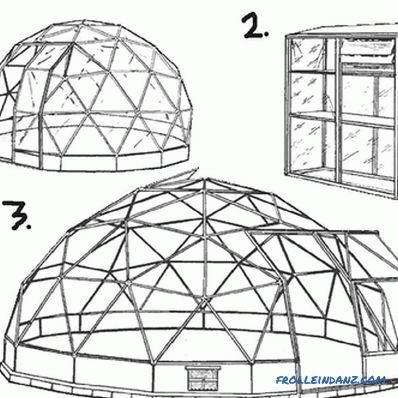 If you have a greenhouse of round shape sunk into the soul, then you need to take into account the bad the air exchange characteristic of this type of building can be improved by installing several additional side vents in the roof. 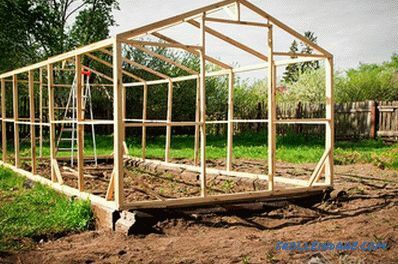 The wall shape of the greenhouse will help you save space on the summer cottage. In addition, you put less effort on its heating. 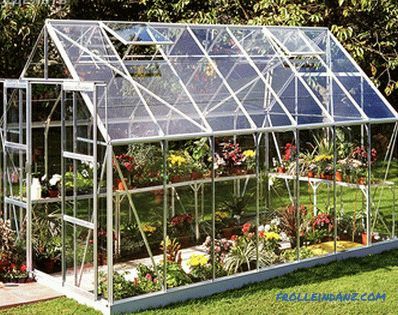 It should be mentioned that combined greenhouses under glass are the most popular. In this design for the frame take a bar 50 * 50 mm, and often glazed with old window frames, which will save you money. Someone puts the windows in the PVC profile. 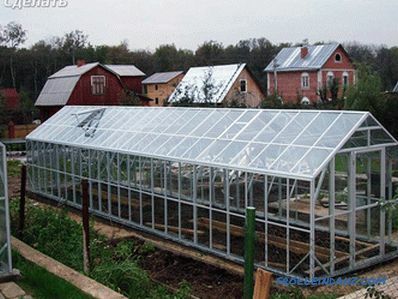 At the same time, the upper tips are qualitatively strengthened and an arched roof with metal trusses is installed.Cover the roof with polycarbonate or plexiglass. 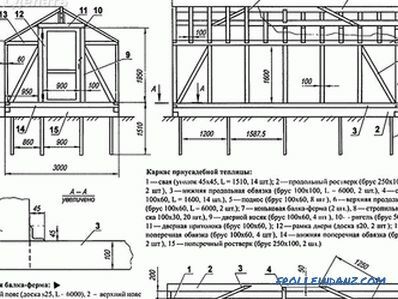 Having decided on the shape of the future structure, you need to go to the drawings. Someone who will do the classic way - using a pencil and paper, and someone who has a basic basic knowledge of the PC, can make them in 3D, for example, using the program Google Sketch Up. 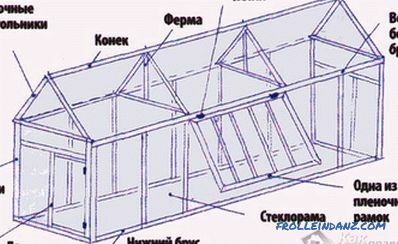 The drawings are a very important step in building a greenhouse, as they will help you calculate the necessary the amount of consumables and determine how much money you need to make it. 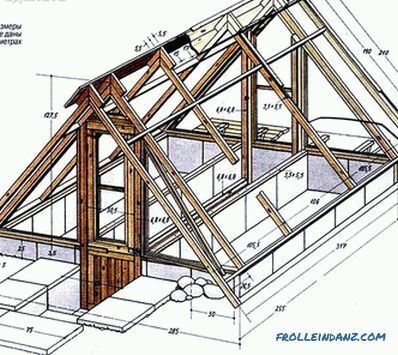 For example, let's take the draft of a gable glazed greenhouse made of wood and see what needs to be reflected when drawing up a drawing. If you take the standard format of glass 1600 * 2200 mm, 4 mm thick, and a bar of 100 * 100 mm, then we get the ideal distance between the vertical posts, which will be equal to 800 mm. It is noteworthy that it will be half the width of the sheet. Since the building will be used in winter, the base should be raised above the ground (if 1/2 of the glass height is 1100 mm, then the base should be raised by 900-1200 mm). The maximum slope of the roof covered with glass will be 15 o . 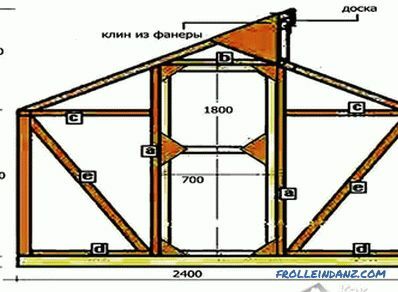 Roof rafter system is preferable to build from a bar 50 * 50 mm. 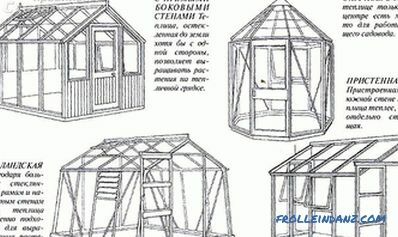 So, you have chosen a suitable place for the construction of the greenhouse and calculated its dimensions with the help of drawings. Now with the help of pegs and rope, you can make the layout of the site under construction. Go to the crucial moment - laying the foundation of the greenhouse. It should be noted that with properly flooded foundation, you can save up to 10% of heat in winter. 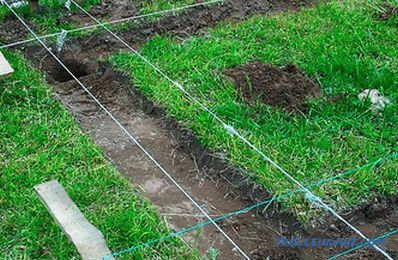 Experts recommend the use of strip footing, which provides the strength of the structure. 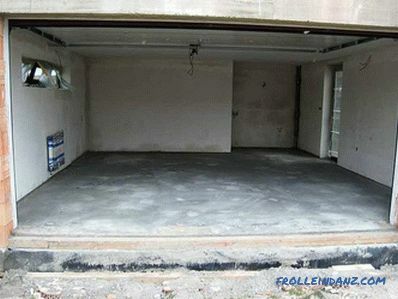 In this case, the concrete is poured to the depth of soil freezing (from 55 to 80 cm). 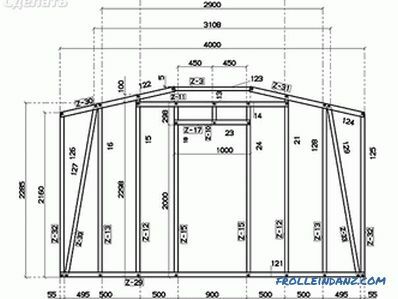 How to fill the foundation for a greenhouse from glass? Dig a trench 30 cm wide and 40 cm deep. Next, pour sand into it that need to tamp. In the trench lay out reinforcement for reinforcement and pour concrete. Erect a plinth 10 cm high above the foundation, while building up the formwork. Using a level, level the top of the formwork and refill the concrete layer to the edges. To create a waterproofing, lay a narrow strip of roofing material or bitumen mastic on frozen concrete. Now, to a height of 1/2 brick at the base of the strapping, make a brickwork. You can slightly change the process of pouring the foundation, however, the principle remains the same - the use of mortgage reinforcement and waterproofing material. 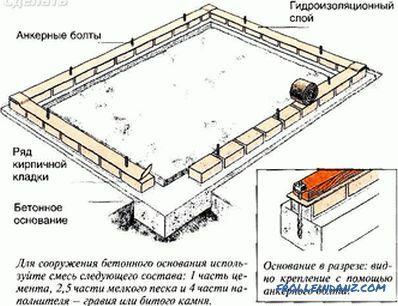 The foundation should be additionally insulated from all sides with polystyrene foam plates. Now it's time to make the frame. 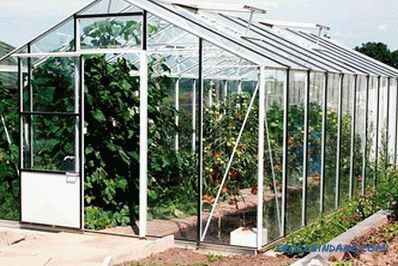 Recall that greenhouses made of glass especially need a strong and durable frame, which can be built from both metal and wood. The first is characterized by its durability, the second - environmental friendliness. 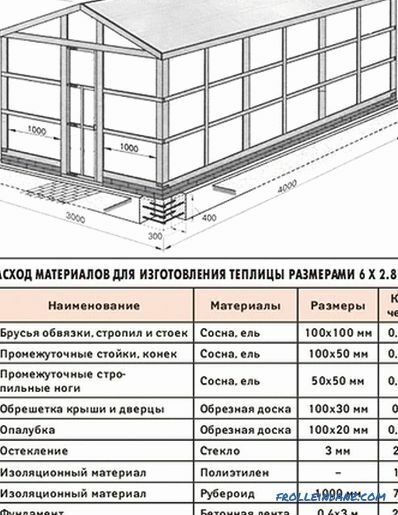 For the erection of a metal frame, pipes or angles of steel are used, and for a wooden frame, bars of 100 mm are used, which are ideally made of autoclaved wood and guarantee the long service life of the structure. 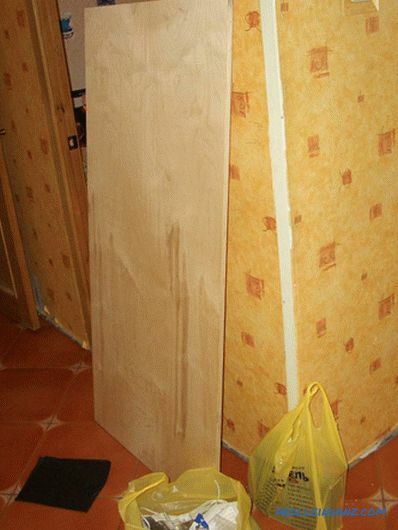 If the wood does not have the proper impregnation, then it should first be prepared by treating it with an antiseptic, then with a stain, and finally paint it. 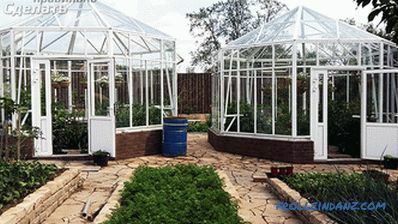 Most of them use old window frames for glazing greenhouses, and the framework for such a building is made of 100 * 100 mm bars. 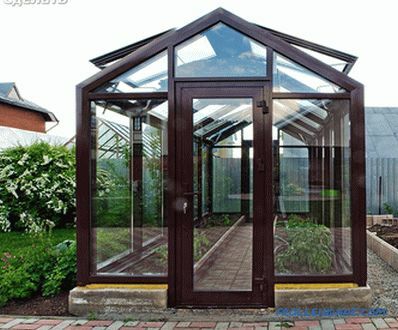 The structure of a glass greenhouse with a wooden frame consists of upper and lower trim, corner posts and support bars. The treated bars with a cross section of 100 mm, i.e., 10 * 10 cm in size, are installed on the foundation brick tape with an additional layer of waterproofing and fasten securely to the base. Then nail the vertical bars to the horizontal bars at the four corners. Upper tying is done by connecting vertical bars with upper horizontal bars. After that, you need to nail support bars to the top and bottom straps. 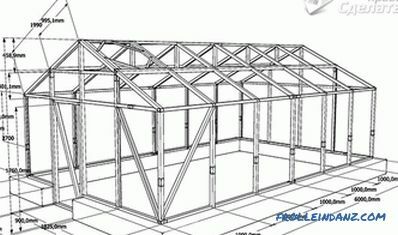 Now you need to make a roof truss system. For central risers, screeds, as well as intermediate racks, a timber of 10 * 5 cm is used. 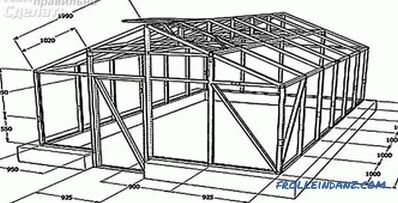 The roof lathing and door frame can be made using 10 * 3 cm bars. Note that the frame with strut fastening is fastened with a cutting point and subsequent twisting with screws. Farms gather on the land. Then they are raised on the frame and to avoid deformation of the roof, fixed on the slide. Finally connect the trusses with a ridge bar. Now you can glaze the finished structure. The glasses are fastened with the help of carnations and silicone sealant, and outside they are upholstered with a rubber or wood bead. The roof is covered with glass from the bottom up, laying it on a layer of putty. 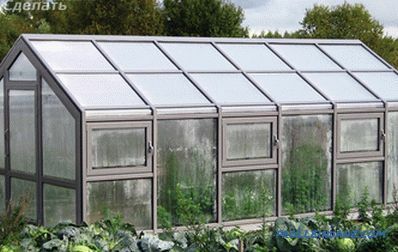 In such a simple way, you can independently build a greenhouse from glass. If you wish to supplement the information in the article with valuable tips, write your comments.